When you think about iPhone docks you're faced with a plethora of options. As most of us come to understand, most of the docks out there aren't perfect and turn out to only make your flawless user experience your iPhone delivers you with, rough. Once in a while there's something so promising that makes you want to hand over your cash for it. That's what this dock is, it's called the Elevation Dock and it's made out of a solid aluminum billet just like the one we just posted about called the Blok Dock only that the Elevation Dock just made it look like someone's DIY project if not all others. 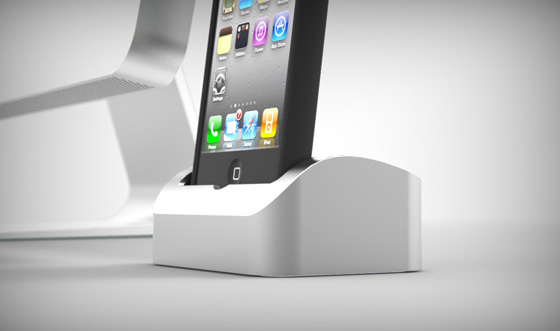 Sync, charge and dock your iPhone or iPod in what might be the most wanted dock ever created. The Elevation Dock has already surpassed a whopping $80,000 in funding over at Kickstarter in only a single day. The Elevation Dock offers more than a clean, sophisticated Apple-esque design like being able to accommodate all iPhone and iPod models with or without a protective case. But what's more important is the fact that this dock unlike many others, is weighted down thanks to the solid aluminum construction, has a low-friction connection and bottom rubber feet for traction will actually stay put where ever you've got it set on top of when you undock your iDevice. Yep, no more having to use two hands and playing the game of tug and pull. Much like an effortless one-finger lift required to lift open the lid of any MacBook portable. The Elevation Dock goes thru many steps before it gets its outside finish you find on Apple's unibody MacBooks. It even has a USB output built-into the back while the more "professional" Elevation Dock+ incorporates a shielded Line Level audio output for bypassing the regular headphone output for better sound quality thru the 30-pin Dock Connector connection. It also comes with a USB wall power adapter. You can grab yours by pre-ordering the Elevation Dock for $59 in silver while the Elevation Dock+ comes in silver and matte black for $79 and $85, respectively.